My family LOVES watermelon. However, I do not love that my children leave watermelon rinds sitting around or that cut up watermelon takes up a lot of space in my fridge. For quite a few years I have been using this cutting method for oranges and then one year I realized it would be a great way to cut up watermelon or other melons. 2) Starting at the top where the white rind and the red flesh meet, slice downward following the curve of your watermelon. 3) Turning your watermelon slightly toward you, start your next cut downward. On these vertical cuts line up your knifes cutting edge with the line where the white and red meet. This takes practice! If you watch that line when you cut it will help you follow the curve of the melon and have little wasted fruit. 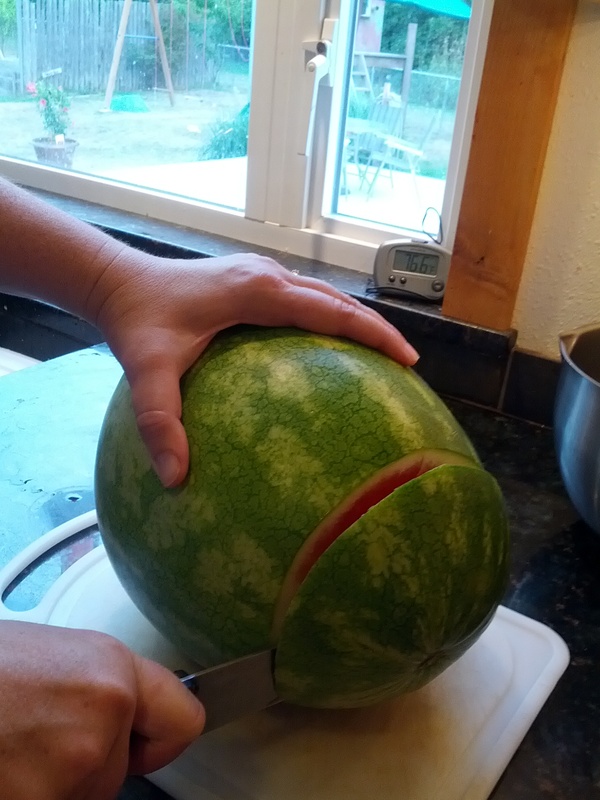 4) Continue to turn the melon toward you and cut more sections until you go all the way around. As you can see, once you get good at following the line and judging the depth of the rid you will have very little waste. I give the ends to the kids to scoop out any goodness. If you have chickens they would enjoy the ends also. None of this goes to waste at our house since our rids go into the compost. Here is your peeled watermelon ready to cut up. 5) Cut up as desired. I like to cut off big slices and make them into squares. This is great for when I am serving for a party or get together. Also, it is easy to store in the fridge and my kids can take a bowl worth for snack time. This method is perfect for other types of melons. If the melon has a center of seeds (like a cantaloupe) you simply split the melon in half after taking off the rind and scoop out the insides.This is also how I prep oranges for a fruit salad or snack. That is so smart!! Definitely ting this!